Family and friends aboard the Hokule'a threw flowers and leis yesterday after scattering the ashes of respected waterman Michael Tongg, who died July 13 at age 63. Enduring choppy waves and wind, about a hundred people gathered in boats, canoes and kayaks off Waikiki yesterday to pay their respects to the late Michael Alan Poi Wo Tongg, a waterman, attorney and family man who died from lung cancer on July 13. The poignant ash-scattering service brought together the crew of Hokule'a, the Polynesian voyaging canoe, and canoe club paddlers. Following chants, or pule, family members threw the flowers strewn on their leis into the water, and a helicopter dropped flowers above the watercraft. "It's an honor to sail for him," said Nainoa Thompson, Hokule'a navigator and a close friend of Tongg's. 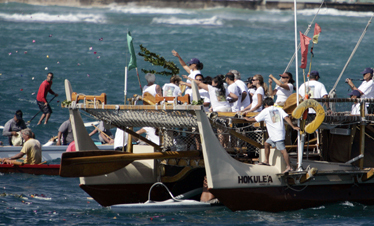 "The Hokule'a would not have been in the water today if it was not for him." Tongg, 63, a family court attorney for more than 30 years, was a former president of the Polynesian Voyaging Society. He also led the Oahu Canoe Racing Association, Hawaiian Canoe Racing Association and International Polynesian Canoe Federation. The Tongg family joined Thompson and Hokule'a crew members aboard the canoe and scattered Tongg's ashes at a surf sport called, fittingly, Tongg's, named after the family, just west of Diamond Head. "That's where he belongs, at Tongg's," said his wife, Janice Tongg. "It was where he learned how to surf and paddle. That was his wish as a waterman. He should have been born a porpoise." The services began at 10 a.m. with a celebration of life at the Royal Hawaiian Hotel's Coconut Grove, then shifted to the sea via the Ala Wai Boat Harbor. Off Waikiki about 10 boats gathered around the Hokule'a, with Tongg's fellow paddlers arriving by canoe and kayak. As the last canoe arrived, Ka'ohu Harada, 23, a crew member of the canoe Nama Hoe, started the service by chanting a tribute. Harada ended with the waterman's saying: "Take care of the ocean, take care of the land, take care of one another," and "paddle with your heart." The paddlers and sailors erupted in cheers and goodbyes to their "Uncle Mike." Family members and friends ceremoniously dived into the water after the ashes were scattered. Janice Tongg said her husband would have enjoyed the service on the water. "He loved the Lord, his family and helping people," she said. "His wish and dreams are that canoeing is to go around the world and the Hokule'a is to go around the world. By using the Hokule'a and the canoes, we bring the ohana and harmony to everybody." Said Thompson, "Mike loves his canoe. He's a man of the sea. It is his home. It nurtured his values. It's where he exercised his dreams, hopes and aspirations, and it was where he became the best he was." In addition to his wife, Tongg is survived by children Malissa, Matthew, Michael and Stacy.